Syria said the Turkish government had informed the Syrian consulate in Istanbul about its plans regarding the tomb of Suleyman Shah in northern Syria. Shah was the grandfather of the founder of the Ottoman Empire. However, Turkey didn’t wait for permission from Damascus and mounted a rescue operation to the tomb, to salvage its relics and evacuate 40 Turkish soldiers who had been guarding it. Damascus says the maneuver was in violation of an agreement signed in 1921. Syria also stated that Anakara would be responsible for any repercussions that could take place as a result of the incursion. 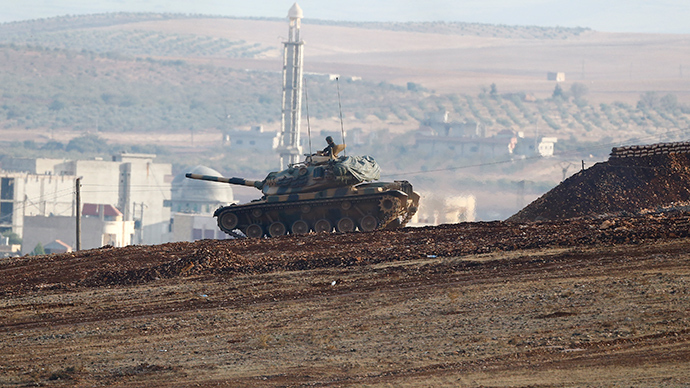 The military operation launched to rescue the holy place was coordinated with the Kurds. The only casualty was a Turkish soldier. The task force of approximately 100 military vehicles, including 39 tanks, crossed the Syrian border to a territory controlled by Kurdish People’s Protection Unit (YPG) fighters and passed through the city of Kobani, recaptured by the YPG from the Islamic State in January. Turkish Prime Minister Ahmet Davutoglu held a media briefing in the capital, Ankara, reporting that 38 soldiers had been brought back safely to Turkey. Syria accuses Turkey of supporting insurgent groups that have seized control of wide areas of northern and eastern Syria, including the Islamic State militant group. The Syrian government statement said the fact that the Islamic State had not attacked the tomb "confirmed the depth of the ties between the Turkish government and this terrorist organization,” according to Reuters. Syrian Deputy Foreign Minister Faisal Mekdad accused Ankara of violating Syrian sovereignty and warned that his country has the right to defend itself. “Damascus reserves the right to defend our land and properly respond to this aggression at the right time,” he told pan-Arabist satellite TV channel Al Mayadeen.